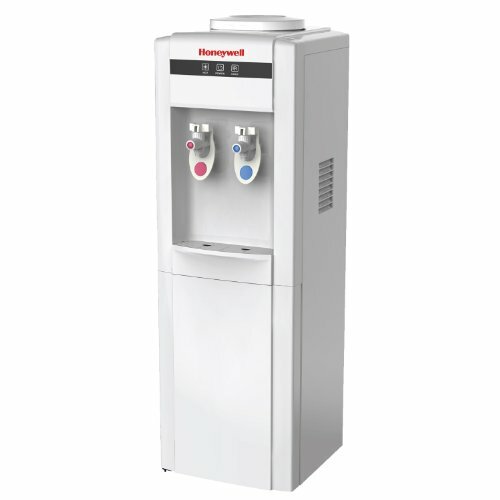 The Honeywell HWB1052W 39-Inch Freestanding Water Cooler Dispenser uses 3 and 5-gallon water bottles and features a food-grade stainless steel water tank to provide clean drinking water all day long. Access to both hot and cold water is available with the push-in lever system and there's a hot water child safety lock. This water dispenser's funnel features a prong that helps prevent spills when using bottles with spill proof caps. This 85-watt water cooler comes with a removable drip tray for easy cleaning and added convenience. Compressor cooling makes getting the right water temperature simple, with a heating capacity of 5-liters per hour up to 194-degrees and a cooling capacity of 2-liters per hour up to 50-degrees. This item stands 39-Inch tall by 12-Inch wide and has a white finish. This unit features a storage space at its base and is ETL Certified. The Honeywell HWB1052W 39-Inch Freestanding Water Cooler Dispenser comes with a 1-year limited manufacturer's warranty.